OZZY OSBOURNE has announced a partnership with online fundraising platform Omaze offering one lucky fan a once-in-a-lifetime experience of being in his entourage for the day, complete with the never-before-offered opportunity to watch his Las Vegas show from the side of the stage. The campaign will support Love Hope Strength as they work to save lives one concert at a time. 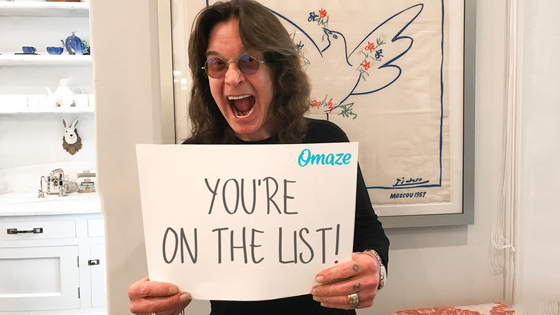 Fans can enter for their chance to win this unforgettable experience at Omaze.com/Ozzy through September 30, 2018 at 11:59 PM (PT). Love Hope Strength (LHS) is saving lives one concert at a time. Since 2008 they've been hosting marrow donor drives at concerts and festivals across the globe via their Get on the List campaign, which encourages people to sign up for the International Bone Marrow Registry with a simple cheek swab. This is so incredibly important-every three minutes, someone in the US is diagnosed with a blood cancer like leukemia or lymphoma and many can be saved with a bone marrow transplant. Sadly, 6 out of 10 patients will never receive the lifesaving transplant they need. LHS is changing that. And with your help, they can increase those odds and save more lives.